A super smart firewall for your home WiFi network. Protects all your devices from malware and hackers. Brings enterprise-level security to your home. No configuration or management hassles. Protects you from ransomware, phishing, identity theft, privacy compromise and attacks on all your connected devices. Protects you from malicious websites. Hides the web sites you visit from prying eyes using strong encryption. At your option, removes ads from all devices. Improves your browsing speed. Protects you from malicious advertisements. At your option, set parental controls for all your devices. Keeps inappropriate content away from your children. Through our extensive global attack-based threat intelligence sensor network, we keep a watchful eye in order to model the attack behavior on the Internet at large to keep ALL of your networked devices secure. If you want to learn more, please visit our Technology section for more details. RATtrap quietly functions 24/7 as an electronic sentry between modem and router. It automatically blocks malicious attempts to gain entry into your home network, computers, laptops, tablets and phones. You can see real-time notifications about blocked attacks and learn about the health of your home network through the mobile apps and web dashboard. If you already have an external WiFi router, you’re all set. RATtrap is very simple to setup. 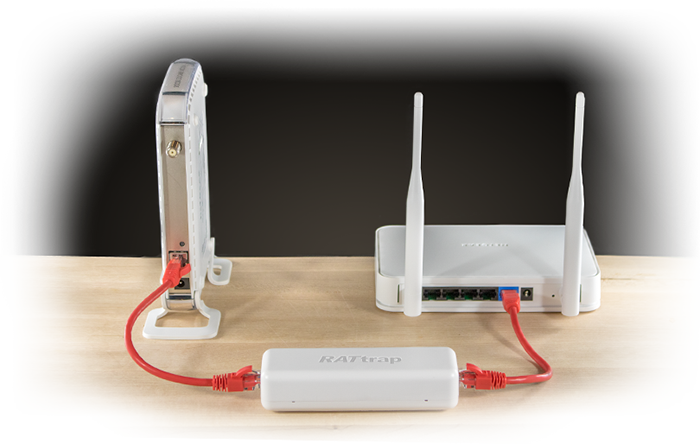 Just connect RATtrap between your modem and the WiFi router. Plug in the power cord and RATtrap will start up automatically. All your devices will then be instantly and continuously protected from hackers. If you don’t already have an external WiFi router, we recommend a SimpliNET Mesh WiFi System. Get the piece of mind you deserve! Protection Service for first 12 months. only $9 per month. Cancel anytime. how to best protect your WiFi system from hackers.